Camilla MacPhee is distracted when Ashley and Brittany, her step-daughters-to-be, visit. 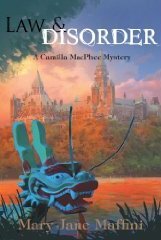 As the girls strive to excel at dragon boat racing, Camilla struggles to discover who is killing Ottawa lawyers and leaving lawyer jokes to make the point. As the jokes start to hit too close to home, Camilla does her stubborn best to head off the killer, hampered by her assistant, the police, the bossy sisters, her real estate agent, her favourite burglar, her absent boyfriend, Ray Deveau, and the visiting girls. Well, at least they’re all safe. Oh wait, maybe not. Will the final joke be on Camilla?